GOODS (GNOME Online Oceanographic Data Server) is an online tool that helps GNOME users access base maps and publicly available ocean currents and winds from various models and data sources. You can then download the files in a format that can be read directly into GNOME (e.g., map files in BNA format; current and wind files in netCDF). Visit the public GOODS site: http://gnome.orr.noaa.gov/goods. Here is guidance to help you download maps, download wind forecasts, and download ocean currents forecasts using GOODS. 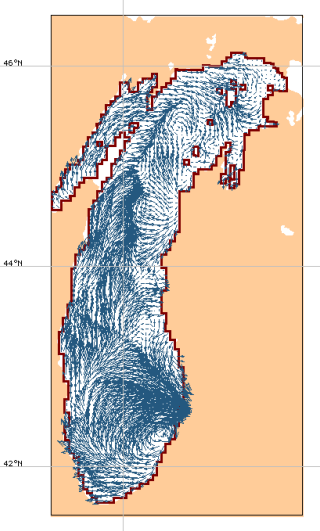 Winds and map imported from GOODS for Lake Michigan. 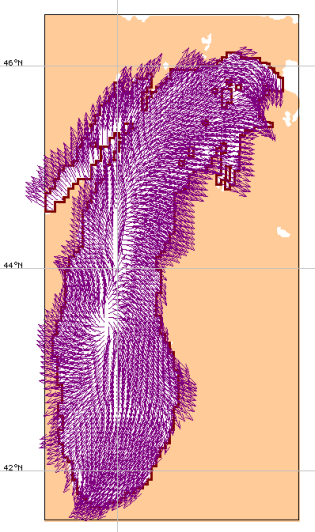 Currents and map imported from GOODS for Lake Michigan. Many of the data sources made available through GOODS are operational products that were already publicly available. Some sources have been contributed from modelers developing forecast capabilities for their particular region of study and wanting to share those results for use in emergency response. We are continually updating the GOODS site as new data or forecasts are made available to us to share with the GNOME user community. The GOODS interface is also dynamic, with improvements and features being added periodically. If you have suggestions or know of available forecasts you would like added to GOODS, please contact the GOODS team. Note: Data available through GOODS originates from a number of sources and is provided on an "as is" basis. NOAA OR&R does not endorse or represent that this information is fit for any particular purpose and cannot guarantee availability of data. Please contact data originators to ensure appropriate usage. Web links are made available by GOODS for individual sources. Video: High-Frequency Radar: Supporting Critical Coastal Operations with Real-time Surface Current Data: View this 5-minute video to better understand and make use of real-time coastal current information obtained from high-frequency radar (known as HF radar). The video explains how HF radar is used to provide detailed information about coastal ocean surface currents, and describes the important role that HF radar products play in critical coastal operations, such as hazardous spill response. Finally, it covers basic capabilities and strengths of HF radar, as well as how to access coastal current data. Questions: Contact us with your questions, comments, or suggestions for GOODS.